As I look back over my outfits these past few weeks, I noticed that I haven’t been wearing much color (which shouldn’t be a surprise since I feel most comfortable in neutrals). But today I decided I needed a little burst of color~ something about the grey skies and lack of sunshine I guess! That being said- here is today’s look. I’ve decided to wear jeans and a bright orange top. I love this top- it’s a great color and super comfy. 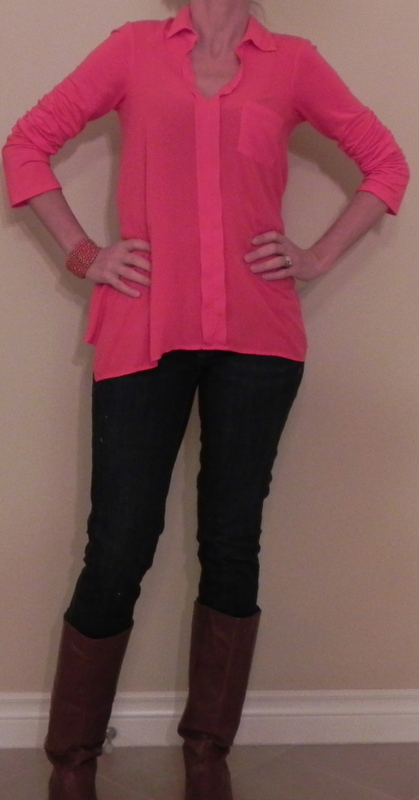 For my first look I simply paired it with jeans, added my orange bracelet and brown boots- easy does it. Then I decided that I should maybe add another layer- especially for working moms- so I tucked the shirt in and added a blue blazer. Instead of the boots, I chose ballet flats (and yes, my feet will probably freeze- this look is for you lucky moms who live in warmer climates). I also chose my leopard belt as a fun little surprise. Now let’s take a moment to discuss my ‘before’ look. I chose an old one for you today (so I apologize if you’ve seen it before) but it’s perfect to compare with today’s look. Adding this blazer polishes the outfit up a bit. I love this orange bracelet, thank you Julie! The leopard belts adds a little flair! Gorgeous top!! I absolutely love the color! Love seeing how you styled this blouse. I got it in a dark mint green and haven’t worn it yet. I’m going to try it with my black skinnies and grey boots. Thanks! Oh and like the tucked in version too!